Does e-voting require a paper trail? 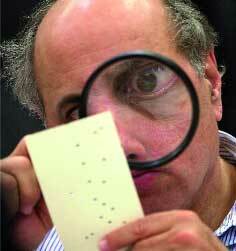 Judge Robert Rosenberg used this magnifying glass to examine ballots in an effort to determine voter intent during the hand recount in Broward County, Florida, November 2000. Although election officials agree that e-voting security measures need strengthening, no clear consensus has emerged over how it should be done, analysts and government officials said. At the center of the controversy is how votes cast on electronic machines could be recounted manually should the systems crash or prove unreliable during an election. Voting rights advocates favor a so-called voter-verified paper audit trail, while technology experts say that it could be done by other means. Some states have already made up their minds ? California last month passed legislation requiring all of its direct recording electronic machines, or DRE machines, to have a paper audit trail by 2006. [IMGCAP(2)]During the November presidential election, Nevada will use DRE machines that have printers attached. But there are other ways to back up e-voting systems without resorting to using paper, a method that some voting experts say entirely defeats the purpose of e-voting. Christopher Baum, vice president for public sector research at research and consulting firm Gartner Inc., Stamford, Conn., said that votes cast and stored on direct recording electronic systems can be backed up using electronic storage devices, such as compact discs or digital memory, and that the Help America Vote Act already requires an internal audit trail. "There are lots of choices other than paper," Baum said.